c event E1.9, Lecture Room SR 18 (PCC) on Wednesday, July 18, 2018, 14:30-15:00 (30 min). 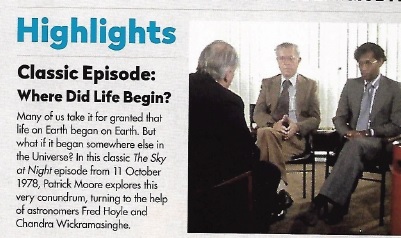 It was 11 October 1978, 40 years ago next year, that Patrick Moore interviewed Sir Fred Hoyle and Professor Chandra Wickramasinghe on the hypothesis that “Life is a Cosmic Phenomenon”. Since that time experiment after experiment, have accumulated evidence consistent with the hypothesis; and today in 2017, Panspermia remains the “best” model for life in space. 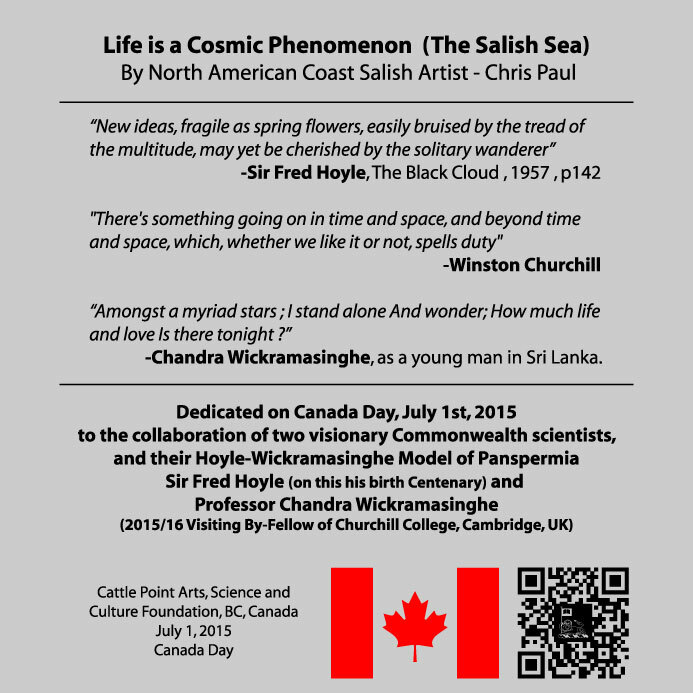 Truly mainstream science is on a 40 year scientific journey – a “Convergence to Panspermia” . I am happy to be able to report the rapid acceptance of Panspermia into academia. A new generation of astrobiologists have embraced panspermia especially as it relates to the solar system. Dr. Chris McKay, Astrobiologist at NASA AMES gives animated explanation of panspermia. As we visit short period comets like 67/P, the Rosetta Mission catches glimpses of the “seeds of life” without having a complete set of experiments on board. 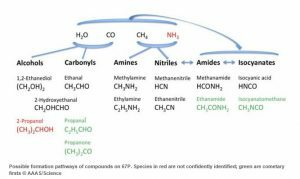 The good news : as we have predicted, the complex molecules found are consistent with Panspermia. We await MIDAS results from the Rosetta Orbiter, by PI Mark Bentley. Even though he is seeing particles down at the virus size level, he is being conservative (encouraged by his peers) calling the specks “Dust”. 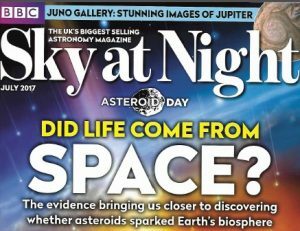 If only ESA scientists would “dare to dream”, and announce the “dust” is consistent with the theory of Panspermia. Consistent with the proposal that viruses and bacteria are carried by Comets like 67P. Let’s face it, accepting the existence of microbes in short period comets is not too far a leap from accepting the interchange of microbes between planets. 67P is on a short 7 year orbit. Not much more mysterious than an asteroid. We are not asking for misrepresentations nor inaccurate statements BUT the facts are that these specks on MIDAS do seem to be consistent with viral and bacterial clumps. If they are not microbial clumps and 67P has no microbes, then this really would be worthy of a paper. But what if these were inter-stellar comets? The Panspermia debate now switches to long period comets with orbits over 100,000 years. Last year ISON was such a comet. Most think these comets are elliptical and come in from the Oort Cloud. But with orbits sometimes over 100,000 years there is some possibility that many are parabolic and even Inter-stellar. But what if these inter-stellar comets contain, and regularly bring to Earth, new types of viruses, bacteria or nano-microbes (as yet unidentified nano- and picoeukaryotes) that are part of the Milky Way biopool but new to the Earth? It is possible to hypothesize that the galaxy is homogenized and that inter-stellar comets will contain the same galactic strain of microbes. This is the Hoyle-Wickramasinghe Model and the basis of our calculations in a recent paper. Because of the age of the galaxy and the probable evolution of microbes on bodies across the galaxy, the long period comets can be expected to be carrying microbes new to the defence systems of animals and plants on Earth even though they are part of the same galactic biopool. In the future, an RNA/DNA sample taken from an advancing long period comet, might well be used to identify the star source and so the catalog of microbes contained within.